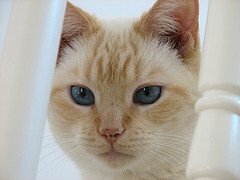 What exactly is a Flame Point Siamese cat? Well, that can be a bit complicated to answer since all parts of the world seem to classify this type of cat differently. In most parts of the world this cat is actually known as the "Red Point Siamese", such as in the UK and Australia. But in the US, the Cat Fanciers' Association doesn't even recognize them as a Siamese breed. Instead they're known as "Colorpoint Shorthairs". The name Flame Point was given to these cats by non-breeders, because of their red, flame-like points. The "flame" term is thought to have come from Persian and Himalayan breeds, because it is commonly used to describe them. Unfortunately, the flame point cat has not been registered, so it is unable to participate in any cat shows. However, it is a beautiful and very classy looking animal with a regal air about it. These cats carry themselves with pride and elegance and have a distinct and beautiful overall appearance. Like other Siamese cats this variation has a vibrant personality and is a loving, sociable, and intelligent animal. These cats make great pets because they are so dedicated and loyal to their owners and they are also perfect pets for those with kids and other pets in the home. The Flame Point Siamese has a very curious nature, as is the case with most Siamese cats, and is an entertainer and something of a chatterbox, again like other Siamese cats. They make delightful pets and a regal addition to any household.